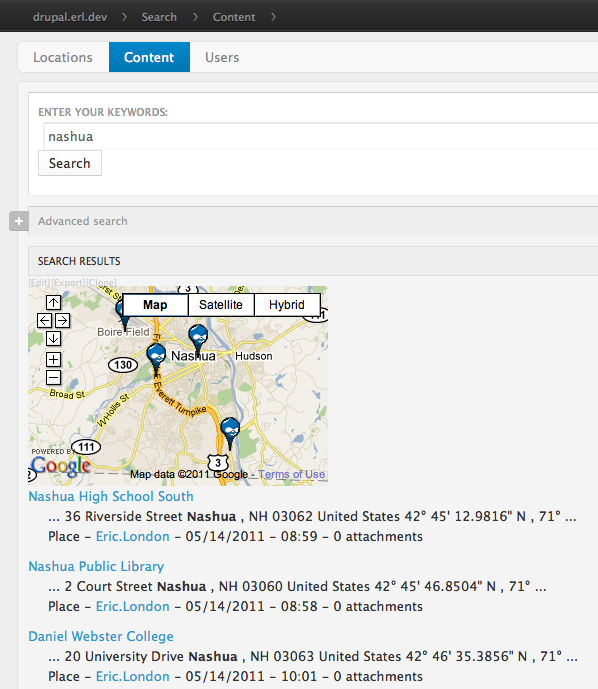 In this article, I’ll explain one way to embed a GMAP view into your search results. Location main settings (admin/settings/location), ensure “Enable JIT geocoding” is enabled. Location map links (admin/settings/location/maplinking), ensure “Google Maps” is enabled for Unites States. Location Geocoding options (admin/settings/location/geocoding), enable “Google Maps” for United States. GMap (admin/settings/gmap), enter your Google Maps API key. I created a content type with a single Location CCK field for address. I made this field required and set my desired collection settings. I added some sample nodes, and verified the location coordinates were being added dynamically. Arguments: Node: Nid; Action to take if argument is not present: display empty text; Enabled: Allow multiple terms per argument.